Dr. Richard Holmes Powell, first president of South Georgia State Normal College (now Valdosta State University), acquired ten Babylonian clay tablets for the school's students to study. The tablets, which are roughly 1.5" square, are imprinted with Cuneiform writing and are indicative of daily record-keeping in ancient Mesopotamia. They were purchased in 1920 from archaeologist and antiquities dealer Edgar J. Banks at a total cost of $40. Banks provided translations for each tablet, along with his personal guarantee regarding their authenticity. Local legend has it that Powell purchased or arranged for the purchase of the tablets while he was on leave from the college serving abroad in the Red Cross in 1918. However, no evidence has yet been found to substantiate that Powell's Red Cross service was even overseas, or as to the connection between him and Banks. 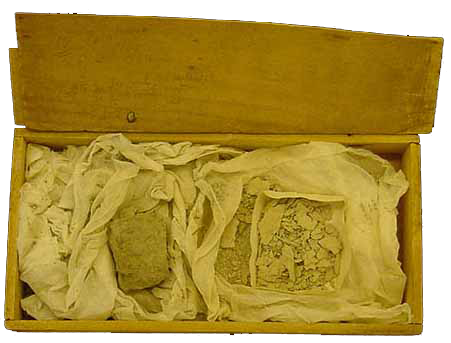 The tablets were wrapped in tissue paper and shipped in a wooden box. Tablets numbered one through eight are in excellent condition; however, tablet number nine has been reduced to fragments and dust, and tablet number ten is very worn and fragile. A penciled notation on the box top reads, "#10 sundried, in poor condition," and in his letter, Banks notes that, "The sun dried tablets are seldom well preserved." It is unknown as to how tablet number nine was destroyed; either by shipping or after coming to the college. Edgar J. Banks was a lesser-known archaeologist and did much of his work in the early 20th century. 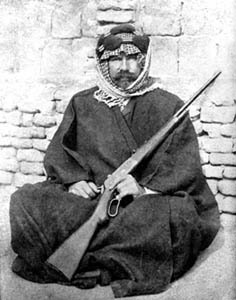 In 1900, Banks applied for and eventually received permission from Ottoman authorities to dig in the modern-day city of Bismya, Iraq, site of the ancient City of Adab. It is likely that the tablets similar to the ones owned by VSU were acquired are from this area; however, he also purchased tablets from workers at other sites. Valdosta's tablets were primarily from the ancient Babylonian cities of Umma and Drehem. Many of Banks' Babylonian tablets are owned by academic institutions and museums across America, including The University of Utah, the University of Minnesota, South Dakota State University and the Science Museum of Minnesota. According to Banks' biographer, Ewa Wasilewska, "he imported at least 11,000 such relics to the United States, and some estimates suggest the number may have been as many as 175,000 pieces." VSU is fortunate to be among the institutions that own a collection of Banks' Babylonian clay tablets. The thumbnail of each tablet is linked to a page with a complete front, back, and side view of the tablet, along with a translation by Banks himself, really more of a summary of where it was found and what it might contain. The tablets have been translated by Dr. Cale Johnson, cuneiform scholar of UCLA, and may be found in the Cuneiform Digital Library Bulletin. In addition to translations, the article will explain the significance of some of the tablet names or places. Further information on Banks' summary translations can be found in the correspondence below related to the tablets. 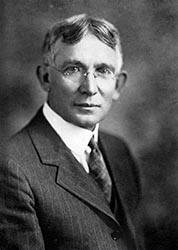 Transcript: Letter from Edgar Banks to President Powell April 30, 1920. Information related to Ancient Mesopotamia during the time of the tablets has been compiled by Dr. Melanie Byrd. A map of major cities mentioned on the tablets, a timeline of Mesopotamian civilization and a bibliography of relatedresources are available. Edgar James Banks, Bismya or The Lost City of Adab New York : G. P. Putnam's Sons, 1912. Online version of Banks book. A joint project of the University of California, Los Angeles, and the Max Planck Institute for the History of Science, Berlin. This Cuneiform database is a collaboration of the University of Birmingham in England and the British Museum. Presents a database of digital images of cuneiform tablets. This is the site of the South Dakota State University Archives, and discusses their collection of Banks' tablets and how they were acquired, along with image scans of the tablets. Article on Banks and cuneiform tablets linked here: Crystal Gamradt. "Forgotten Past: Solving a Mystery of Forgotten Antiquities and Finding Their Significance to the Present." Site for Science Museum of Minnesota, which has some of Banks' tablets. There is a link to an excellent article titled, "The Forgotten Indiana Jones" by Ewa Wasilewska, who is writing a biography on Banks. She is a researcher at the University of Utah, which also possesses some of Banks' tablets. Site for the Cuneiform Inscriptions of the University of Minnesota; the University has some of Banks' tablets, and also provides interesting general information about Cuneiform writing and the cultures that used it. Links to articles about Banks as well. University of Notre Dame's "Ancient Manuscripts" site, which contains a good bit of information about cuneiform tablets. "Your Android tablet out of date? Our tablets are 4000 years old! Some among the younger generations might be surprised to know that tablets existed long before Apple and Microsoft created the high-definition, flat-screened versions so ubiquitous today..."
"Write like a Babylonian. See your monogram in cuneiform, the way an ancient Babylonian might have written it." From the University of Pennsylvania Museum of Archaeology and Anthropology. ** Note to Researchers: If the scans provided of the tablets are not adequate for your study, or if you note problems in orientation of the tablets or with the translations, please contact us at dsdavis@valdosta.edu We will try to fix any mistakes.